When I was in Turkey on my way home I was surprised to hear from Kingsley Holgate and his partner Sheelagh Antrobus (who seems to do most of the administration work for Kingsley lucky man) he is a very famous overland traveller mostly in Africa but his most recent adventure, rather lavishly sponsored by Land Rover with new discovery’s is from Cape Town to Katmandu. They were looking for some tips from the road I had just travelled. My first tip was that this was probably the wrong time of the year for northern Iran and Nepal, but the schedule was dictated by other things and they are well equipped in the truck department and have a series of fixers and contacts with charities they support to help them along so that should all be fine. They cannot stay in their trucks as I can with Nelson so I guess they will need to make more use of hotels where they cannot easily camp (ie most of Pakistan and India) and it will be a bit cold for camping in tents. 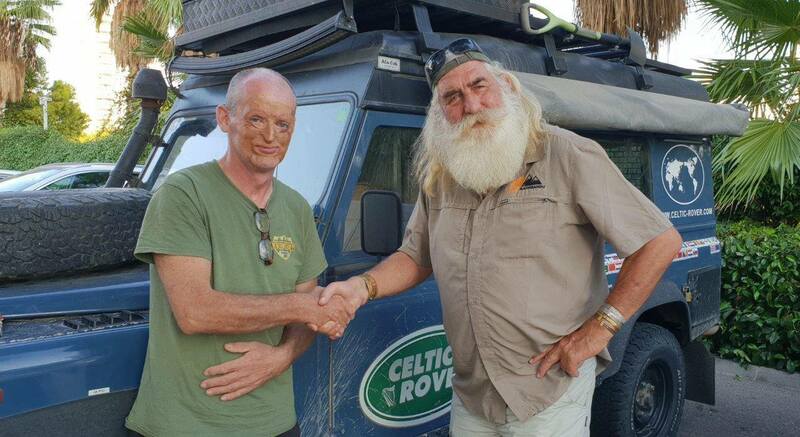 It did make me reflect that trying to do the trip I did, which is much longer, higher and in my 22 year old Land Rover – sometimes by myself and without any fixers, was quite adventurous or at times, like in the Gobi desert with Tony, perhaps a bit unwise. All that means for me that we had a real adventure, not always easy or comfortable, but since I have come home the most common summary I tend to give people is just that – it was a proper adventure in all its attributes! Kingsley and Sheelagh had read some of the posts in my blogs and encouraged me to assemble and expand them into a book, depending on my work commitments I may end up doing just that ! Watch this space!